Are you socially devoted? | What's up @ Skawa? However not everybody is using smartly this medium as a channel for two-way communication. Brand pages tend to forget that social media serves as an excellent opportunity to build credibility, trust and loyalty. Do you? In social media the faster you respond, the better. If you really care for your audience and potential customers, then you respond in a matter of minutes. The study show that the really socially devoted brands respond in 4 minutes! 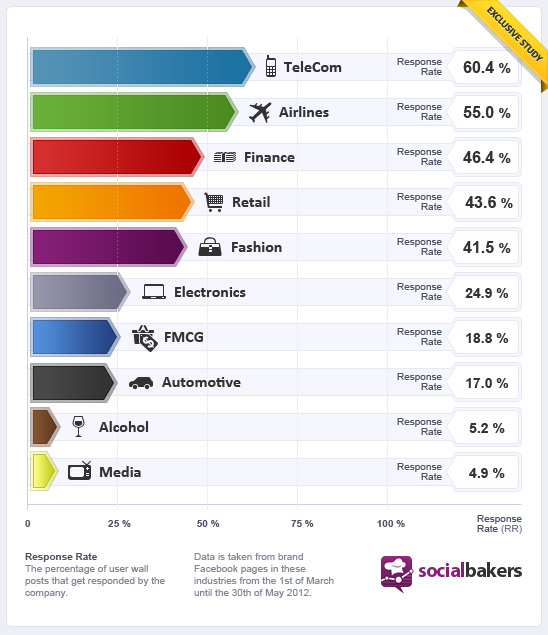 I just found an interesting study by socialbackers on the responsiveness of companies on social media. It is worths to take a few minutes examining the infographics on response rates split by industy. Note that the study shows that brands that offer services in the telecom and airline sector are the best in responding, still hardly reaching 60% in response rates. My experience and my strong belief is that small businesses would perform much better results if tested, as they have to care about each and every potential customer, who appears on their horizons to stay in business. This entry was posted in Business, Online sales, Other and tagged facebook, responsiveness, social media by Csík Judit. Bookmark the permalink.